Home » New Nickent 4DX Evolver Uses "CYG Technology"
New Nickent 4DX Evolver Uses "CYG Technology"
I've had my Nickent 4DX Evolver since about February but it's only been in the last few weeks I've actually been able to use it outside. To be able to interchange shafts quick and easy was definitely an appeal of playing this club. So I was glad when Nickent sent one over (Full review coming soon). So far I've really liked the performance, so I was pleased to here about Nickent's plans for a new type and improved hosel. This hosel has twenty-six different positions to alter face angle, launch angle, lie angle and the loft not to mention the Evolver's original capabilities to interchange the driver with the shaft of your choice. Can you say cool! This new technology from Nickent is called "CYG Technology" because it allows players the opportunity to "Change Your Game" by changing the face angle up to 3 degrees in either direction. The ability to change the face angle combined with the existing option to change your shaft provide the ultimate experience in adjustability and extreme confidence. On a windy day all players can choose to lower the trajectory of the ball flight to combat the weather conditions. The New Nickent CYG technology gives the average golfer the treatment of a TOUR professional. For years, TOUR players with access to a Tour van have had the opportunity to alter the face angle of their driver. Now any player or fitter can open the clubface 3 degrees to combat a hook or to close the clubface 3 degrees to battle the day's slice or power fade on his own. In addition to open and closed club face positions, the Nickent CYG hosel also allows the player to increase or decrease loft by to help battle the wind, or hit it high for a feathery landing or to find the proper trajectory to maximize distance and roll. "The 4DX Evolver driver was the original driver to offer the players the ability to be Interchangeable" said John Hoeflich, Chief Operating Officer of Nickent Golf. 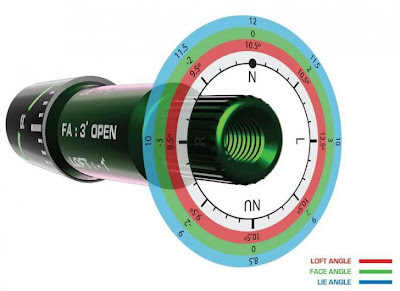 "Now all players can quickly change shafts and adjust loft up to 1.5 degrees. The new hosel can also change the lie angle and face angle up to 3 degrees. The ability to change face angle will improve confidence at address in all players. 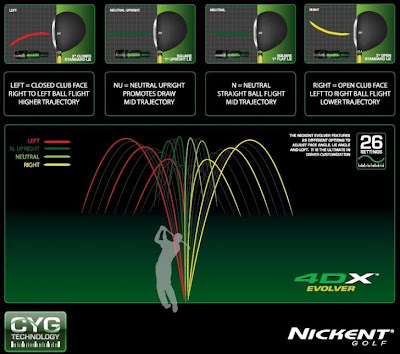 The Nickent 4DX Evolver with the all-new CYG hosel is the ultimate in customizable drivers." Nickent CYG gives all players the ability to fine tune their game, no matter what element stands in their way. The CYG hosel allows for total adjustability allows the player the opportunity to find the right flight trajectory for them. By closing the face angle, the loft of the club increases at impact which promotes a right-to-left ball flight with higher trajectories. By setting the face angle open, it decreases loft at impact creating a lower, more penetrating trajectory with a left-to-right flight pattern. The new hosel, rotated 180 degrees creates a neutral face angle and an upright lie angle. There are 26 different combinations of adjustability to customize your driver to your needs. The new Nickent CYG Hosel will be a feature of all 4DX Evolver drivers with no additional charge. The new hosel will be available as a regular feature of the 4DX Evolver starting May 1st at a wide variety of retail shops as well as NickentGolf.com. The same torque wrench that comes with the original 4DX Evolver is used to loosen the shaft, then with a simple click any player can adjust the face angle to find the perfect setting for their swing. With a plethora of shafts available in a multitude of flexes as well as 26 face angles to choose from the Nickent 4DX Evolver driver is in the closest thing you will find to owning your own tour van.